Some animals have an amazing ability to sense things we as humans are oblivious to. Their emotional intuition, awareness of surrounding, and even an indescribable sense of things unseen give them gifts we will never have. 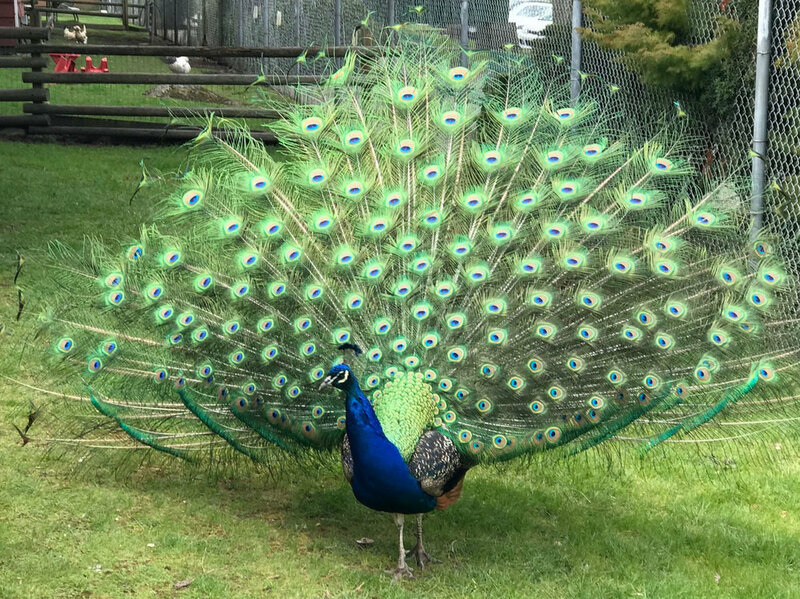 Growing up in the Pacific Northwest we had a menagerie of animals, which included horses, donkeys, goats, rabbits, chickens, cows, dogs, cats, and exotic birds such as peacocks. Our pair of peacocks, Saja and Merak, spent the majority of their time elegantly strutting around the property, bossing the dogs around, courting the chickens, picking small fights with the roosters, using our deck railing as a perfect perch and latrine site, and waiting for table scraps out the kitchen window. They were not silent creatures but instead had a vocabulary of sounds and calls from clucking to calls of warning. Despite their daily antics they did have an astute sense of danger, unperceived to us. Minutes before the ground shook from the Nisqually earthquake of 2001, I remember noticing both peacocks suddenly taking flight and landing on the highest post point in site (an arch above the riding area) and suddenly calling out with their voice of danger “earthquake”! Being lucky enough to call the beautiful west coast home comes with the periodical reminder that we live in an ever changing and seismically active part of the world. Seismologists with the Geological Survey of Canada record over 2500 earthquakes across western Canada each year. Natural Resources Canada states that over the past 70 years at least 100 earthquakes have been recorded off the shore of Vancouver Island of a magnitude large enough to cause severe damage if they had occurred closer to land. As part of the Pacific Ring of Fire, west coast earthquakes occur due to the presence of active fault lines and the dynamic dance of the earth’s plates, as they collide, sliding past one another or diverge. Along with earthquakes, our coastal living comes with the threat of tsunamis. Our government, first responders, communities, and perhaps even you have carefully planned what to do in the face of such natural disasters, however do these plans include your four legged family members? Below is an outline provided by the AVMA (American Veterinary Medical Association) of what to include in your Pet Evacuation Kit. Remember to keep your evacuation kit located by an exit and ideally in a watertight container. First aid items and food items all will have expiry dates, which require periodic updating. Making sure that your pet is wearing a collar with tags or that your pet has been microchipped is also very important if you are separated during a disaster. If your pets are home and you are not at the time of the incident, having a trusted neighbour or close friend with knowledge of how to enter your home and where your pet and their supplies are located is also paramount. Such a major event can be very stressful to you and your family, pets included. The change in environment and disruption of routine can be the biggest cause of stress for Fluffy. Attempting to establish a normal schedule in the face of disaster can be incredibly difficult but can help reduce the stress for your pet. Lastly, find comfort in one another. The simple act of being with your four legged friend and being able to pet and sooth them will reduce the fear and stress of what has just happened for both person and pet.